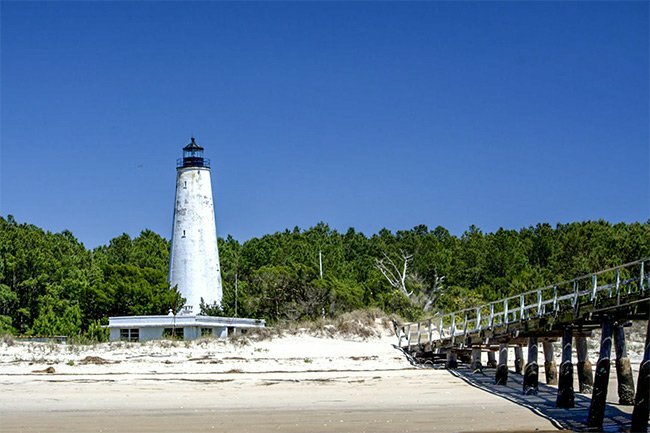 The Georgetown Lighthouse – also called the North Island Light – is the elder of the two federally-operated lighthouses that remain in South Carolina. Guarding the entrance to Winyah Bay in Georgetown County, the lighthouse was built in 1811 and restored in 1867 after suffering damage during the Civil War. The light’s history dates to 1789 when Revolutionary War patriot Paul Trapier donated land on North Island for the construction of a light. Rice and indigo were Georgetown‘s major cash crops, and planters and merchants depended on the city’s port to trade their wares. Ships traveling between North and South islands, which flank the entrance to Winyah Bay, needed a light to ensure safe piloting. The newly-formed federal Lighthouse Service appropriated funds towards the construction of the light in 1795 and again in 1798. 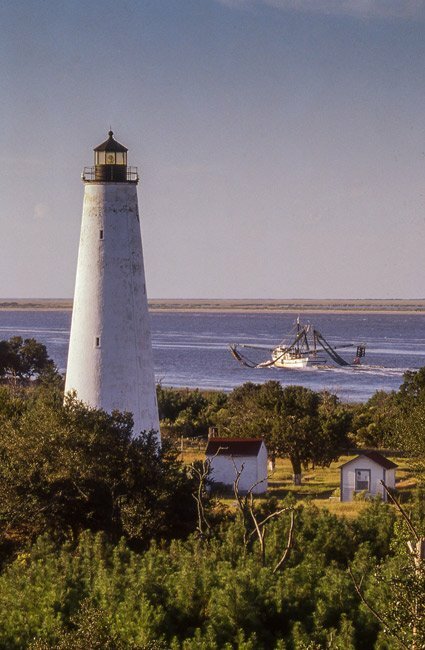 In 1801 a 72-foot-tall cypress light tower was constructed on Trapier’s parcel, though it was destroyed by a storm in 1806. The light tower was rebuilt in brick in 1811 with the use of slave labor and remained in use for several decades. The solid masonry structure even served as an encampment for soldiers during the War of 1812 and as a refuge during the hurricane of 1822 that wiped out most dwellings in the area. During the Civil War, Confederate troops used the light tower as a lookout, only to have it captured by Union troops in May of 1862. The tower suffered damage during its Federal occupation; it underwent extensive repairs in 1867, at which time its height was increased to 87 feet. Though the 1886 Charleston earthquake reached as far as Georgetown, the new light suffered minimal damage from the disaster and has been in continuous use since it was built, though it became automated in 1986. Today the light is operated by the United States Coast Guard. Two resort villages for planters once graced North Island. The original one – called La Grange – was established in the eighteenth century. In 1777, it was the site where the Marquis de Lafayette first landed in America after a 54-day voyage from France. The second village, named Lafayette in his honor, was up and running by 1820. It consisted of a church, more than 100 vacation homes, and several plantations. Wealthy white families gathered here to socialize and escape inland humidity. Hurricanes in both 1820 and 1822 damaged the buildings on the island, and during the 1822 storm, at least 125 people drowned – the vast majority of them slaves. The community rebuilt by 1825, this time adding a school. However, hurricanes continued to ravage North Island, and these natural disasters, combined with the Civil War, led to the demise of the village. 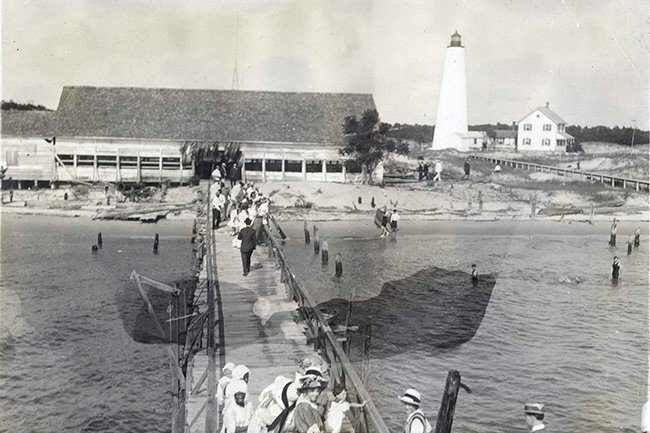 In its place, a pier and pavilion were built in 1910, and visitors came to North Island for day trips and evening dances. The pier and pavilion eventually burned, signifying the end of North Island as a beachside destination. In 2001, the lighthouse property became part of the Tom Yawkey Wildlife Center Heritage Preserve. Tom Yawkey, former owner and president of the Boston Red Sox baseball team, willed 31 square miles of land – which included both North and South islands – to the South Carolina Department of Natural Resources upon his death in 1976 with the exception of the lighthouse acreage, which later was added. The preserve includes a diversity of natural communities, including marsh, wetlands, longleaf pine forests, and the open ocean. Wild game and non-game species alike are protected here, including more than 200 species of birds. The following article was generously contributed to the SC Picture Project by Becky Billingsley of Myrtle Beach. 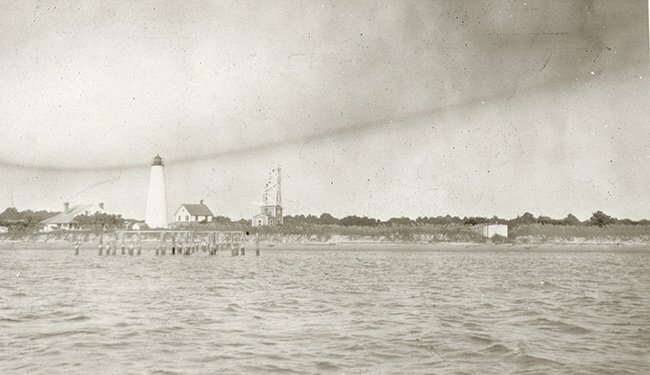 Its beauty belies the purpose of the lighthouse lens, which was critical for survival and for the local economy. In these days of sonar and radar and Doppler, it’s hard to believe that for more than a century such a fragile creation guided seafarers safely into port. 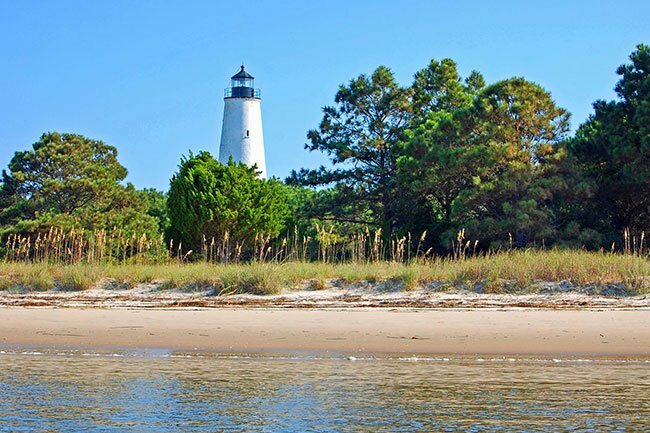 The Georgetown Lighthouse, located 14 miles from the port city on North Island, is the oldest operating lighthouse in South Carolina, and one of the oldest in the United States. During the Civil War, the circa 1811 brick conical structure was heavily damaged. 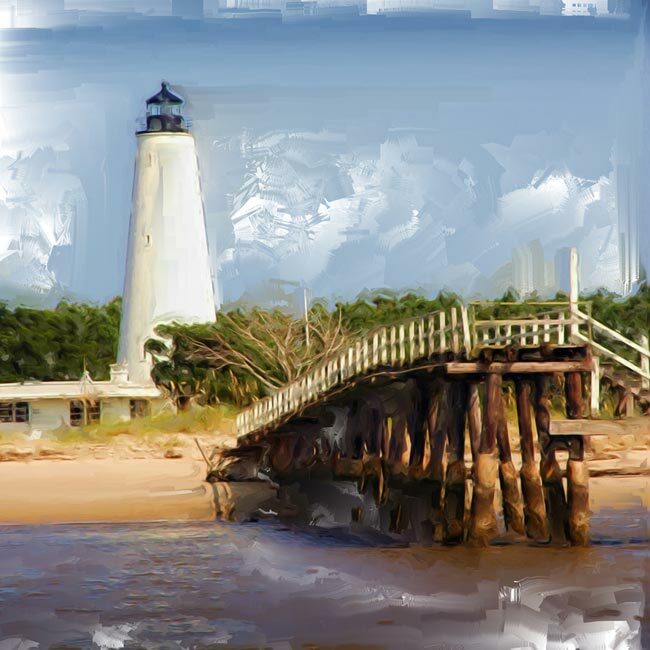 Its reconstruction in 1867 included extending the lighthouse to 87 feet and installing a 5th order (1st order is the largest of 11 orders) Fresnel (pronounced fray-nell) lens. Sautter, Lemonnier and Cie in Paris manufactured the lens, which was invented by French physicist Augustin-Jean Fresnel in 1822. “It’s a series of clear glass prisms above and below the light source, which captures as much as 80 percent of the light source and beams it out to sea,” says Robert “Mac” McAlister, a historian and author who was instrumental in getting the lens returned to Georgetown. “The more prisms there are, the more light.” The light was fixed (versus rotating), and its concentrated beams could be seen up to 15 miles away. Whale oil, then kerosene kept the light burning inside the lens until it was electrified. 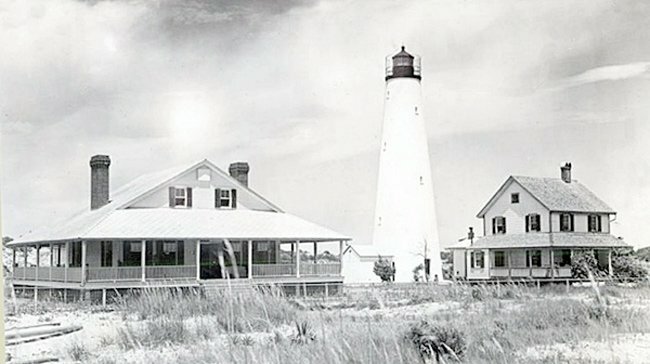 Lighthouse keepers who lived on the sparsely inhabited island kept its bristled edges clean and unbroken until 1968, when the U.S. Coast Guard took over the lighthouse’s operation. In 1986 it was automated, and in 1999, after 132 years of service, the Georgetown Lighthouse Fresnel lens was removed and retired from use. 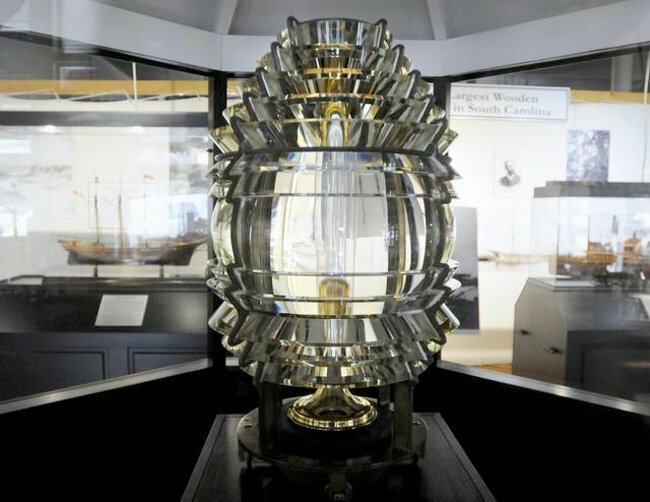 The lens was displayed at a USCG facility in Miami, Florida, but after the SC Maritime Museum was established in 2011, its members began the process of seeking the lens’ return to Georgetown. On July 31, 2014, a reception was held to welcome the lens into the museum’s collection on a 10-year loan from the Coast Guard. It’s handsomely displayed inside a replica of the top of the Georgetown lighthouse, where its welcoming warm light still beckons visitors. We are visiting Myrtle Beach this summer for a few days. I LOVE lighthouses. Is there a tour of one in the area? Terry, thank you so much for writing in! We would love to hear any and all stories you can think of about being stationed here. If you think of anything else you can share with our readers, please let us know because your experience is so valuable. Thank you again! Stationed here in the mid 60s. Magical place with a million great memories. Yes, Tom Yawkey was a first class person and he along with the those who worked on “South Island” treated the Coast Guard exceptionally well. 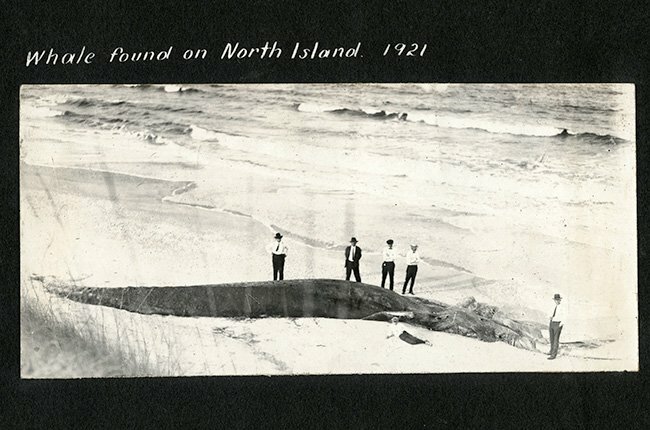 The “Skinner Pilots” were great masters of the Inlet & Bay. Sorry to see the light in its present condition. We doubt it, but you can reach out directly to the Tom Yawkey Wildlife Center, which owns the property. The phone number is 843-546-6814 – hope this helps! Is metal detecting allowed on North Island? Can I send this to a friend who is from Georgetown, but now lives on Hilton Head? He’s an architect. Are there still tours? My family and I are traveling down there in two weeks. We’d love to come see the beautiful lighthouse. No, it is closed to the public. Is this lighthouse open to the public ? Going tomorrow for the first time. Can't wait! I was stationed there in 1972, the lenses were still in place and I met Tom Yawkey. The painting makes it look abandoned. In 1926, my mother and her family were living on the island, and the only other family there was the lighthouse keeper and his family. It is my understanding that my grandfather took care of a radio station/relay that he maintained for the U.S. Navy. I would dearly love to go there once. I love lighthouses – what a beautiful sight!